Show Your Toyota TLC With Routine Services at Rusty Wallace Toyota! Keeping up with routine services is the best way to show your car major TLC and save money in the long run. 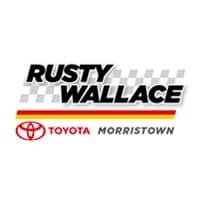 Rusty Wallace Toyota in Morristown, conveniently located for Knoxville and Sevierville drivers, makes it easy to stay on track. Regular scheduled maintenance. Check your owner’s manual to stay on schedule and repair and replace the little things before they become big problems. Oil changes. Keep your engine clean and lubricated with regular oil changes. This keeps your car running efficiently and adds to the life of your car. Air filter. Ditch clogged air filters for clean ones to help improve your car’s fuel economy and acceleration. Tires. Taking care of your tires is a must. Check your tire pressure frequently to make sure your car is properly aligned and tires are safely inflated. Washing and detailing. Professional car washes and details will help maintain your vehicle’s factory finish. We track your vehicle’s maintenance history for you, so you have a complete record of what’s been done and when it’s time for service. It’s easy to schedule an appointment at Rusty Wallace Toyota! Simply call (423) 714-1531 or use our online scheduler.